One might try writing to http://www.yadvashem.org/ for information. Shalom and happy Translation Day from a former Hebrew-English translator. This is a very interesting question, Jill. So far I have managed to find only a list of interpreters from the Soviet team. Their names are mentioned in the book about Nuremberg by J. Gofman (in Russian). На Нюрнбергском процессе синхронными переводчиками с немецкого языка на русский работали Е. А. Гофман, С. И. Дорофеев, Т. Ю. Соловьева, Е. Е. Стенина (Щемилева), Т. С. Ступникова. Синхронный перевод с английского языка осуществляли И. М. Кулаковская, Э. М. Мамедов, Т. А. Рузская, О. А. Трояновский. Синхронный перевод с французского вели Н. Л. Еселева, Н. В. Орлова, М. А. Соболева (Бердникова), К. Ф. Стариков, К. В. Цуринев. Would you mind transcribing the names for those people who don’t read Russian (I’m thinking specifically of the gentleman who asked the question in the post)? Thanks. Interpreters from German into Russian: E. A. Gofman, S. I. Dorofeev, T. Yu. Solovieva, E. E. Stenina (Tschemileva), T. S. Stupnikova. Interpreters from English into Russian: I. M. Kulakovskaya, E. M. Mamedov, T.A. Ruzskaya, O.Ya. Troyanovskiy. Interpreters from French into Russian: N. L. Eseleva, N. V. Orlova, M. A. Soboleva (Berdnikova), K. F. Starikov, K. V. Tsurinev. It is also mentioned in the book that a grand-nephew of the great Russian writer, Lev Tolstoy, was working as an interpreter for the French delegation. The Russian group of the American interpreters was headed by Tatiana Trubetskaya. Fascinating question! I once wrote a paper on the interpreters at the Nuremberg trials for a university course and here are some of the names I came across during my research: Patricia Vander Elst (née Jordan), Peter Less, Wolf Frank, Peter Uiberall, George Wassiltchikoff, Elisabeth Heyward, Leon Dostert, Sigfried Ramler, Edouard Roditi, Haakon Chevalier, Stefan Horn, Armand Jacoubovitch, Frederick Treidell, Marie-France Skuncke, Evgenia Rosoff, Youri Klebnikov. I never found a complete list of names. AIIC is probably the best place to contact for more names. My grandmother Ludka Prymka, was also a translator at the trials. They also asked her to witness their hangings. In your list you mention a Wolf Frank. I am wondering if, instead, it could have been Grete Wolf. According to everyone I have met in my husband’s family, and the few relatives of his mother, my husband’s mother, Grete Wolf, was one of the simultaneous translators (German, French, English) at the trials. Probably during the main military tribunal as that is when my father-in-law (then courting Grete) recognized and pointed out Ohlendorf – and that’s how he was caught. I wrote more about this to Elke – who has contributed so much on this blog. If you have any additional information, it would be greatly appreciated. Thank you. As an ad-on: I found out that my mother-in-law (who had also been in the Kinder Transport and was sent to England) also had to wear an officer’s uniform while she did her translation. I am trying to encourage my husband to find a picture of her as there are interpreters faces that apparently still have no names. I was mistaken about my father-in-law who I said pointed out Ohlendorf – however he recognized him and gave testimony against him at the trial, as well as some others. Shalom to all. It is really nice how the names are coming together here. “The Yad Vashem Archives do not have list of translators of the Nuremberg trials. Hello – there is a family story that my great-uncle Harold Israel (1909 – 1984) was one of the translators, but we’ve no proof. If anyone comes across his name I would be most interested. I once met a lady who lived in Bermuda called Ali Bloch, she told me that she was a translator at the Nuremberg trials. She was an avid orchid collector and had a real zest for life, one of the nicest people I ever met. She had some link also to the Gestetner family who I believe were of Hungarian origin. Armand Jacoubovitch’s granddaughter (Miranda Richmond Mouillet) has written a book called ‘ A Fifty-year Silence’. It was a compelling story and history and since I wasn’t aware of Armand’s role at the Nuremberg trials it cast a new light on the horrors of WWII. do recall him telling us he dealt with A. Speer and his proving this by giving us a photo showing him together with Speer After Speer’s release from Spandau prison. activities? Your kind response would be much appreciated. Waldemar Heidtke was my great uncle. We have a signed copy of Albert Speer’s book, Inside the Third Reich, as well as a detailed scrapbook from his time as a translator during the Nuremberg trials. He told us many stories. My high school German teacher, Reinholdt Kieslich, told us he was a Nuremberg interpreter. Another teacher at the same school (Punahou School in Honolulu) was Siegfried Ramler, whose role as an interpreter is documented on the Web. We knew a lady in Bismarck, North Dakota, born about 1931-32, Dolores M. Koller, who said she was a Nuremberg interpreter or translator. Seems a bit young. Could she have been Dolores Koller who lived in Neenah, Winnebago, Wisconsin in 1940? She was a stenographer and born in 1919. According to 1940 census. My mother’s uncle was said to have been a translator at Neuremberg also. His name was Col. Hugh R. Schwecke. Is there a chance that more information on the trials will be released as we pass the number of years necessary for privacy and security? 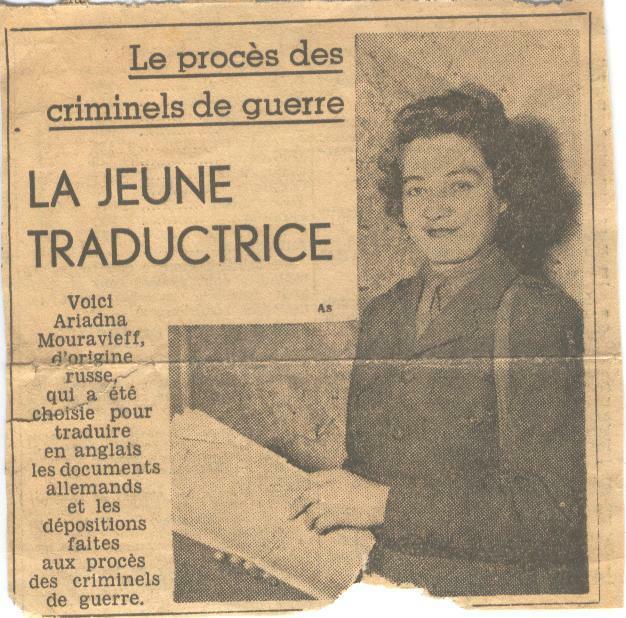 My grandmother, Antoinette Aronin, was a translator/interpreter for the Nuremberg trials. She was born in Romania, educated in Switzerland, emigrated to the U.S. and married a Russian Jew. Since she was widowed, when her American-born sons were serving in the Army during WWII, she volunteered as an interpreter. I know she was fluent in several languages but I don’t know which languages she translated. My uncle, Bernard Brener, was said to be a translator/interpreter for the Nuremberg trials as well. He was American-born, and, if I recall my mother’s stories, was present during Baldur von Schirach’s interrogation. A list of the Nuremberg interpreters would prove helpful. Growing up I lived across the street from a Nuremberg iterpreter named Gregory Lee Hill and even saw him on a war documentary on tv years ago. I can’t find any information about him or his family now, including anything about his work at Nuremberg. My maternal grandfather, god rest his soul, was a German interpreter at the Nuremberg war crime trials. An ad was posted in the Milwaukee Journal accepting applications for interpreters. My grandfather was chosen out of around 100 people. He spoke fluent German, English, Swiss, and Sweetsadeuch (sp). Though my family missed him terribly, we we’re all very proud of him. I know I’ve told many people over the last 48 years the story of my grandpa and how proud I am. I am told that my first cousin, once removed, Joseph Radojcsics, was a translator at the Nuremberg Trials. That first generation (which included my Dad) spoke German before they spoke English. It was apparently not the “High German” of the upper class, but rather “Low German.” I am told these were actually two quite different languages, I suppose akin to English & Cockney. In Joey’s obituary, it stated he was a translator & Dad always said so as well. I don’t know if this is correct…are there any definitive published lists? I tried to find one on this site, but couldn’t. Any help would be appreciated. My husband’s father was an interpreter at the Nuremberg Trials. His name was Joseph E. Goeser. Lived in Miami FL after coming back from Germany until his death in 2008. Hello, I just came across this. We, the German region of AIIC, have put together an exhibition on the Nuremberg interpreters in 2013, done more research on it and expanded the exhibition which has been shown in various places already. If you want to know more, go to our website at profession-of-interpreting.org. There is a lot that we still do not know, but we are getting better. Maybe I should say that we concentrated on the simultaneous interpreters, not those that interpreted during the questioning outside the courtroom. I hope that this can answer a few questions. My father Henry Maengen told me he was a translator at the trials. My father was in the U.S, Army at the time, Jewish and stationed in Germany. So his skills were used at the trials. He has since passed away however. I wish I had asked him more about his experience. My father, Eric Simha, was an interpreter at the trials working for the US Army. He passed away in 1986. *Jesús Baigorri-Jalón (2016 /2004 /2000) From Paris to Nuremberg. The birth of conference interpreting. Amsterdam / Philadelphia: John Benjamins. I am still interested in the subject and would like to know if any of the participants in the conversation, such as Andre Simha, whose father’s name was mentioned to me by many UN colleagues, keep any records or memorabilia. *Gaiba, Francesca (1998) The Origins of Simultaneous Interpretation. The Nuremberg Trial. Ottawa: University of Ottawa Press. *the book Baigorri-Jalón, Jesús (2016, English edition) (2004, French edition) (2000, Spanish edition) From Paris to Nuremberg. The birth of conference interpreting. Amsterdam / Philadelphia: John Benjamins. I am interested in this subject and in the history of interpreting in general. If any of the readers has kept records (documents, photos, etc.) from their relatives, please let me know (baigorri@usal.es). Eric Simha was often mentioned by colleagues at the UN when I was working on the book Interpreters at the United Nations (2004) Salamanca: Ediciones Universidad de Salamanca. I used to work at WHO Hq in Geneva in the office that hired interpreters for conferences. I remember Eric Simha who was an interpreter at the Nurembourg trials. I think Hélène Pfaendler was another, and possibly Gedda Prejsman. Both ladies were also interpreters at WHO. I just saw your comment in this conversation. Further down I have explained about AIIC’s project ‘One Trial – Four Languages’ (profession-of-interpreting.org). We have tracked many of them down, including Mr Simha. We know about one Helen, but no futher details, maybe she married and was then called PFaendler. Does WHO keep records on their interpreters, so one could find out? Another one was Norbert Berger, but we know nothing about him, other than that he worked in Geneva. There is one interpreter called Marc Priceman who later worked for the UN in New York, that is the only Preijsman we have come across. Do you think the WHO archives would reveal some more information? My wife’s family has long believed that my late father-in-law Francis Ian Hamilton Wood, an aeronautical engineer who was fluent in German, had been an interpreter or translator at the Nuremberg Trials. I was once told that the Wiener Library in London might have a complete list but have yet to follow this up. I e-mailed the library to see if they in fact have a list of names. I will post my response once I hear back. I received a reply from the Wiener Library and they do not have lists of interpreters at their library. The suggest contacting the Holocaust Museum in Washington, D.C.
My uncle, Joseph Millner from Detroit was a interpreter. After the trials were over he worked for Ford Motor Co. I am also trying to find information on my Uncle Julius Fewer. I was told he was a translator at the Nuremberg Trials, but that is all I know. My mother Ethel Terhaar was the only WAC at Nuremberg Trials, she went there as a translator. She wrote all about it, I have never read it but one of my sisters has it and I would like to read it. I’m not sure of the name of the book on the trials my mother once showed me but it had a picture of her with other people standing around a piano singing Christmas songs. Here is another link to the list of translators. Marie-Anne Garnier (1921-2007), my mother, officiated as an interpreter at the Nuernberg trials. She spoke both French and German perfectly (hailing from Lorraine) and later added English and Dutch to the list of languages she commanded with extraordinary ease and fluency. She was an early member of AIIC and worked for many years as a distinguished translator and interpreter, including for Euratom and the Common Market organizations in Brussels for 2 decades. It would be great to confirm that Marie-Anne Garnier was on the simultaneous interpreting team at the main Trial (1945-46). Would you, D. J. Stom, have any photographs or records from your mother? I have seen newsreel footage of her sitting in one of the interpreters’ booths within the court room at Nuernberg’s Palace of Justice. She is mentioned in 2 publications / directories that I know of, though not explicitly as an interpreter; she is listed under ‘Marie-Anne Garnier’ as one of 33 research and documentary analysts assisting the prosecution counsel in the “Ministries Case” (USA vs. Ernst von Weizsaecker, et al.) 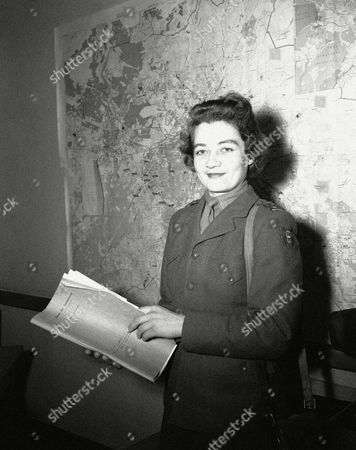 between October 1946 and April 1949, and she appears as ‘Marie A. Garnier’ in the list of civilian personnel actively engaged in the trials as of January 1948 by the Office of Chief of Counsel for War Crimes [OCCWC] and the Office of the Secretary General [for Military Tribunals]. Note that she married D.J.C. Stom in 1951, and was a very active member of the AIIC for over a half century since its inception as ‘Marie-Anne Stom-Garnier’. If you come across additional information about my mother’s contributions during the trials, kindly advise! Thank you, Mr. Stom, for the information. Do you have the reference to the footage you mention? That would probably allow to clarify the context in which your mother worked in interpreters’ booths: the main Trial or the subsequent proceedings. Thank you for your interest. I last saw that news clip many years ago and have been trying to find it again. Any assistance anyone can supply in this matter, e.g. accounts and/or pictures re: the French simultaneous interpretation team during any of the phases of the IMT, would be greatly appreciated! Dear Mr Storm, As my colleague Jesús has already pointed out, we would need to have a photo to be able to identify her. The personnel list does not give the people’s occupation as you already stated. There are films taken on several trial days on You Tube that you can watch. They frequently show the interpreting booths, maybe you will recognize your mother and greatly help us with this. Jesús and myself are both members of aiic and have been on a project on the Nuremberg interpreters for some time. You can read all about it on profession-of-interpreting.org. We are desparately looking to identify more of the simultaneous interpreters and it would be great, if you just helped us find one! Thank you Ms. Limberger. My brother and I are viewing all footage of the trials we can find in a attempt to isolate a clear shot of our mother in the French booth. We’re not certain yet about whether she was part of the French team during the main IMT and/or just one or several of the subsequent NMTs. Do you or anyone you know have a list of the set of six French interpreters on duty during the main trial? As I mentioned in an earlier posting, she is listed as a contributor to the prosecution for case no. 11 of NMT IV in 1948. I’ll be back in touch when I uncover more veritable info and would greatly appreciate any assistance you may be able to lend to this quest! Also, are there any archives of AIIC members? All I have been able to find in a couple of mention of my mother’s name in an article published by Henri Methorst who she met in Holland in 1952 or so and with whom she then worked on many occasions over several decades as an interpreter for numerous recurring conferences. He, she and another colleague by the name of Margie Leenheer-Braid were long-time friends as well as colleagues. Here again, any insight you can bring to this topic would be much appreciated! Mr. Storm, Names like Génia Rosoff, Jean Meyer, Marie-France Skuncke are well known as interpreters from the French delegation. Handrich, Emmanuel: La Résistance… Pourquoi ? Souvenirs des deux guerres et de déportation à Buchenwald 1914-1918 et 1939-1945, Paris 2006. Yes, thank you; I have come across those names. Hopefully we will manage to ascertain whether or not Marie-Anne Garnier (later ‘Stom-Garnier’) was a colleague of theirs during the IMT. Do you know of any archived lists of AIIC members from the early/mid-50s? As pointed out some time ago, AIIC has this project on ‘One Trial-Four Languages’ trying to trace these interpreters. The project website is profession-of-interpreting.org. You can also contact us through there. Now particularly about Ms Garnier who quite certainly was there: do you have a later photograph of her? If you sent me one (or several) I can go through the photos we have of the court room and other situations and try to recognize her. There are some female faces in the French booth for whom we still do not have any names. Thank you for the link to that interesting AIIC project, Ms. Limberger. I do have a clear picture of my mother (Marie-Anne Garnier,1921-2007) from circa 1945. Shall I use one of your AIIC-associated email addresses to transmit that to you? Wonderful. Youz can use elke@katsumi.eu or the contact email on the website of profession-of-interpreting.org. Getting really excited…. I’m not sure if I’m answering within the correct framework, and I am doing it off the cuff, but I can confirm that Gedda (or Hedda) Prejsman is Mark Priceman’s sister. She spelled her name differently. She was an interpreter all (or most) of her professional life, in Europe, but also in the early days of the profession in the US (I saw once a photo where she appeared with colleagues at a conference in the East coast, but I haven’t found the photo again) and in Israel (even before its independence), where she spent a good part of her life, as far as I can remember. Pfaendler rings a bell as someone who taught interpreting, probably at the Geneva school, but I should have to check sources. My late father Charles Thomas Olivier Hunneybell was a british soldier captured at Lille in France fighting rear guard for the Dunkirk evacuation, his army number was 5499989 in the Kings Own Royal regiment, he was marched to Upper Silesia in Poland and was in Stalag 8B / 344, he was working as slave labour in a saw mill/ wood yard, when he escaped with another and made contact with the Czechoslovak resistance, he was with them until a Gestapo officer recognised him and he was recaptured and tortured, among other things thay pulled his teeth out with a pair of pliers. He was again imprisoned, and i believe possibly released by the soviets. Point of the story is, he always hated Germans and never spoke about the war but was said to be one of the translators at the Nurumburg trials, i never realy believed that until shortly before his death we were talking with German friends, and he asked to speak to them, he then spoke at length to my friend in German, and after the lengthy conversation i asked my friend if everything was all ok (knowing my fathers hatred for Germans), but he said it was incredible, my father spoke fluent German and he could have been speaking to his own father, so i have always wondered if he was also one of the many translators at the trials? Hi everyone, I understood from my father that he also worked as a translator at the Nuremberg trials. So I´m also interested to find the list to very. I understand from family stories that my father, Sylvester Stenger, was a translator or interpreter at the Nuremberg Trials. Born in Cincinnati, Ohio, in 1922, he had been in D-Day as part of the 90th Division. After the war was over he was asked to stay for the trials because he spoke German, as well as English. He told us that he had to wear an officer’s uniform while interrogating the German prisoners. That is all I know. How can I get more information about what he did? Any help would be appreciated. What a shame that more accurate rosters weren’t kept of the many individuals who worked so hard to help bring justice to the world. This would have brought much satisfaction to their families today – but of course, that wasn’t an objective. My husband thinks he saw his mother, too – but also isn’t sure. Pity. Computer trouble. Have I just sent you message re Wolf Frankl? Yes, but comments are moderated and I’m slammed with work and didn’t see it until now. A Wolf Frankl was a U.S. guard at the Neuremberg Trials. !n the 1990s he lived in Charlottesville in the U.S.A. Does anyone have information about Ruben Ainstein? He was a polyglot, fluent in Russian, Polish, Lithuanian, German, English and several other languages. Born in Vilno, he studied at Brussels University before reaching Britain in 1943 where he joined the RAF From 1949 until 1966, he worked for Reuters and the BBC. In 1974, he published ‘Jewish Resistance – in Nazi-Occupied Eastern Europe’, but the contents of his book offended and made him bankrupt before his death in 1979. Russia rejected ALL evidence provided by the Poles, deeming it ‘unreliable’. They possibly feared that the truth about the Katyn Forest would come to light. The contents of Ainsteins book suggest that he had access to that Polish evidence. Was he at Nuremberg? Very interesting project! I would love to know where the exhibit will be in San Francisco. Our family story is that my grandfather, Ira Aaronson, spoke several languages, worked for the Immigration and Naturalization Service, and also was an interpreter at Nuremberg. I would love to see some evidence. I could send you a photo for identification, or can you point me to some photos to check? Unfortuately, my mother passed away in November 1985. Were she alive today, she would be 105 years old! My mother was British. She had been working for MI5 in New York – https://en.wikipedia.org/wiki/British_Security_Co-ordination – and then, after WWII, she was chosen to be a translator and interpreter at the Nuremberg Trials. Just came across this today. I found this link which mentions the translators. My late father, John-Louis Merle told me that he was at the Nuremberg trials as an interpreter/translator for French/English. If anyone his able to validate this I would grateful. My grandfather, Cambreth Kane (German mother, Irish father, first school, Normandy, France) was one of them. In the only extant photo he is second from the left at the top, there is a slightly confusing ghostly reflection between him and first figure. The photo was not attached. Can you attach it and send again? I was referring to this photo. I believe, but I am not certain, that in that photo my mother is second from the left, bottom row. Sorry for the delay in approving his photo. WordPress didn’t send me a notification that I had a comment to approve. He will have been translating between German and English, but he was almost as fluent in French, as he was educated in Normandy and Brussels for the first years of his life until he took up his scholarship and St Paul’s in London, utterly trilingual and rather pleased with himself. I imagine that did not go down well. Quite apart from his parentage. I keep hoping that in one of the pictures that gets posted, my mother-in-law will appear. I am married 31 years but never knew John’s mother who died relatively young. While all my husband’s relatives of that generation are now gone, everyone I had met knew that his mother, Grette Wolff, had been a translator, worked for the Americans, and had worn a uniform while doing so. She was fluent in 3 languages. A box of photos came to us a while ago that we haven’t gone thru yet. Perhaps we’ll find something from those days in there. This ties in with the figure I saw of 24 interpreters (simultaneous translators) in all. My grandfather (Cambreth Kane) was one, having a German mother and Irish father. The fact that he was also fluent in French, having started his education in France and Brussels, must also have been useful. But I can’t believe that there is no list in existence. The site of the tribunal seems to have very little interest in the events, largely trading on it merely to further their current activities. There seems even to be a feeling that it’s all a bit embarrassing. My grandfather never talked about it but was then inspired to study law and be called to the English bar. In his late fifties. I understand Lisa Ferraday a Romanian born actress was a Nuremberg translator. Born 1921 Elisabeth De Mezey. The original Woolite Girl. Passed Palm Beach Fl. 2004.